When you stand at the estuary, the place where the waters of the sea and the river join, you can see the great force of this element, the different colored waters “fighting” against each other, creating big waves in the process. 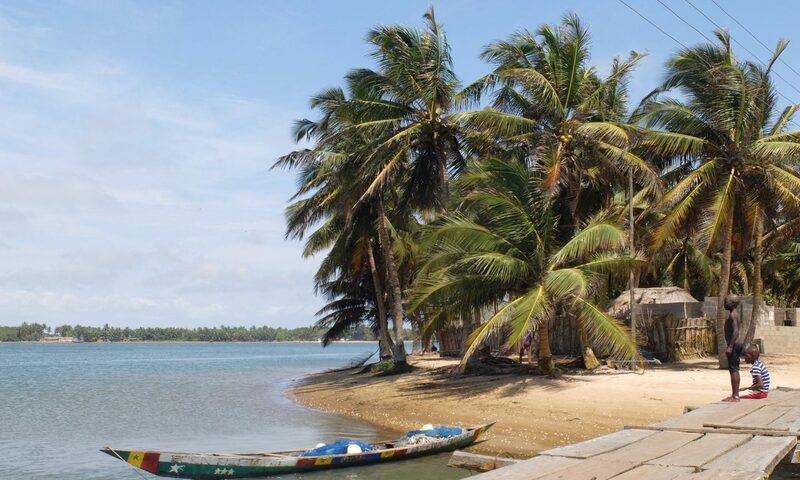 This natural force of the sea waves towards Northeast has the effect that the original estuary was shifted across the Volta River towards the other side. Loose material is carried with the waves and deposited at the estuary. But since the flowing Volta River blocks the sand to be carried further, it creates a deposit that over time would close the estuary completely, if the river weren’t pushing against it and by this shifting the estuary towards East. Originally, the estuary is reopened by a strong current during the rainy season, but since the building of two big hydroelectric power dams in Akosombo and Kpong the water coming through is not strong enough anymore to reopen the estuary. The problem attached to it is that a reduction of sea water into the Volta River makes the river fresher which supported the survival of parasitic worms Schistosomes which causes the human disease Bilharzia. That was the reason for the Volta River Authority to dredge open the original estuary to increase the salt water inflow into the river. To watch this interesting natural phenomenum join one of the boats to see it from the riverside or walk through the villages of Azizanya and Kewunor (see map). The walk through the maze-like paths takes about 45 minutes from Ada Foah and gives a nice insight into life in local fishing villages.